The former presidential hopeful jumped into an issue that has drawn attention — and criticism — as the 2020 race gets underway. WASHINGTON — Hillary Clinton may never be the first woman president, but she's ready to offer a hand to others who might. Clinton has spoken privately with several Democrats eyeing the presidency in 2020, including Sens. Elizabeth Warren, D-Mass., and Kamala Harris, D-Calif., and on Monday launched a not-so-subtle defense after media stories questioned whether Warren and other female candidates are "likable" enough to win the White House. "There's been a lot of talk recently about whether our country is ready for women leaders," Clinton said at event in Albany, New York, to promote a bill in the state capital to protect reproductive rights. "That really takes me back," she added. "Today, I want to thank all of you for your persistence. I know many of you and can attest as to how smart, determined, effective and dare I say, likable, you all are." The audience, which included women leaders, erupted in applause and laughter, clearly getting the winking reference to a recent stories in Politico and other outlets that questioned Warren's "likability." The story prompted criticism from Democrats and others, who viewed it as sexist, arguing the same thing is rarely raised about male candidates, and Warren's campaign sent an email to supporters seeking to fundraise off the backlash. 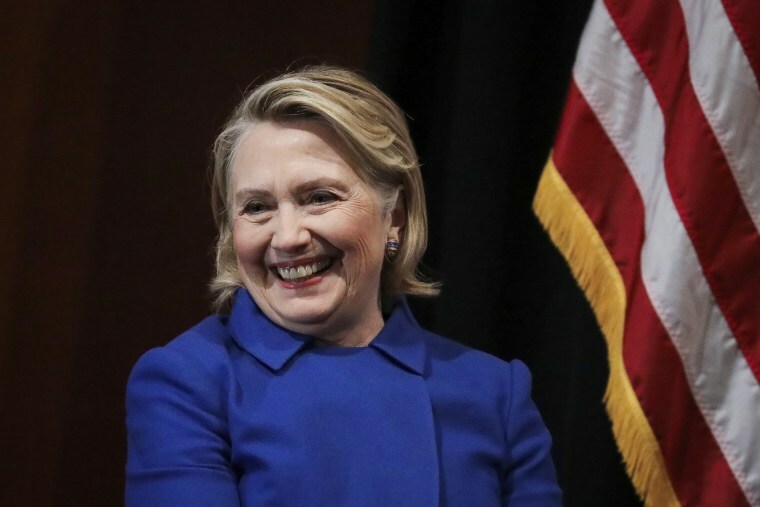 Clinton herself faced the same question, including from former President Barack Obama, who once called her "likable enough" in a debate during their 2008 contest for the Democratic nomination. Clinton was the first female presidential nominee from a major political party in 2016, but 2020 will likely be the first primary contest in history to feature multiple serious women candidates. Warren has already launched an exploratory committee and traveled to Iowa, Harris has a new book due out Tuesday, and Sens. Amy Klobuchar, D-Minn., and Kirsten Gillibrand, D-N.Y., are also weighing White House bids. Clinton has been courted by a number of both men and women thinking of running, and formally spoken with at least five of them, including former Colorado Gov.John Hickenlooper, Los Angeles Mayor Eric Garcetti and Sen. Cory Booker, D-N.J., in addition to Warren and Harris. "I won't comment on private discussions she's had except to say that she's more than happy to talk to anyone considering a run about the challenges (as well as the great things) that go with it, and lessons learned on what to watch for in this next cycle (aside from Vladimir)," Clinton’s longtime spokesperson, Nick Merrill, said in a statement.